where do I start? 4 days after completing this event, I finally have the energy to write about it… it was tough! I had signed up because I need to get some trail running in ahead of Six Inch in December, and most of my training for ADU 100km (January 2017) is being done on flat boring paths. 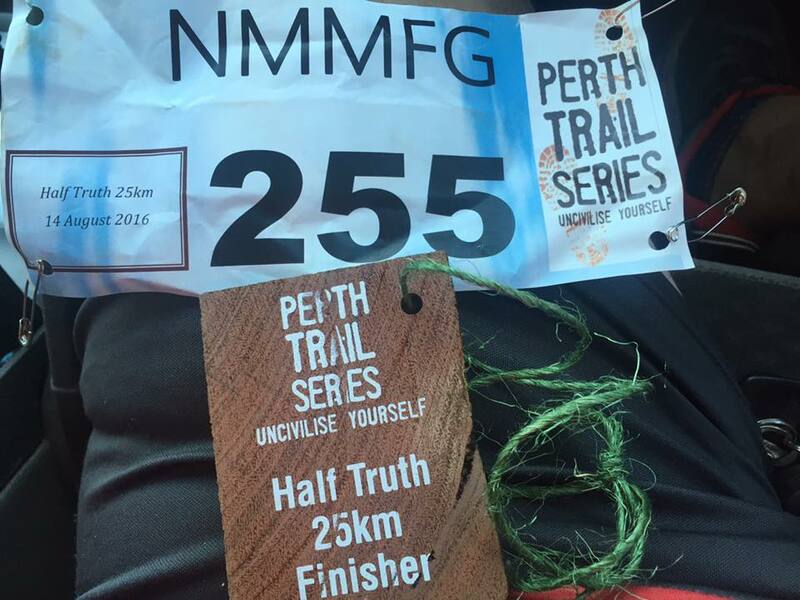 Having done the Perth Trail Series “Moonshadow” night trail event, and reading the recaps others have written about PTS events, I was really looking forward to it and had estimated somewhere between 4 and 4.5 hours would be a good result. I wanted to maximise my chances of a decent run, so I had even had a mini taper in the week and felt good going into the run. We started the run just after the first 50k runners came in at the end of their first lap of 2, we cheered and applauded then lined up to start our own trail adventure. Unusually for PTS, the first km was downhill and with one eye on the pace I relaxed into a nice rhythm and started to enjoy myself. Over the first 5km we covered some beautiful Serpentine trails, single track, technical sections, natural beauty and flowing waterways. It was a bit soggy and muddy underfoot so a bit of attention had to be paid to avoid slipping and sliding etc, and the only complaint I have about that first 5k is that my Garmin Fenix 2 decided to disappear up its own backside in a continuation of the problems I’ve had with it recently. After realising it was resetting itself when I wasn’t looking, I eventually started the Strava app on my phone and had lost track of exact distance covered. At the end of a particularly tough little downhill section, I eventually stumbled into aid station 1 – I couldn’t recall the distance this was meant to me at but in my head I had it down as 9 or 10k – I had a lovely chat with the vollies there, grabbed a half banana, checked the water in my backpack and was off again. Not long after the trail headed upwards – a long, grinding, unrelenting hill with long sections of pea gravel and dirt. “This is it” I told myself, “3 steps”. I could even see why it got it’s name, because you’d go along a stretch of gravel / dirt and then it would level out a little for a while, before presenting you with yet another uphill stretch just around the corner. I felt happy at the top, and looking at the time, i was feeling really confident about the 4 hour time…. I wondered what he meant – was there another final uphill part to this 3 steps? We started heading down a tough, deeply ravined section that reminded me of the escalator section of 6 inch. This must be what he meant – the downhill was killing my quads. At the bottom the volunteer directed is right and then we emerged to where my friend Ben was stationed for his volley position. We’d passed him a few kms into the race and had clearly done a big loop around and over the hill. I started thinking we must have a relatively straightforward run back to the start / finish from this point – I thought I’d check in with Ben on distance left as by now I had no idea of how far I had gone at all. Steep, rugged, no end in sight, and each “step” comprising of a steep muddy climb to a pit or gouge in the side of the “hill” (mountain more like) – I could see it was already claiming victims, and the moment I started the climb myself, it hurt. At first I would aim for a rock or tree or some other feature – then take a short rest to catch my breath. Then I would take a number of steps (10, 20) and rest for a similar count. Eventually I would struggle to take just one step. Ben had come up from his Marshall position by now and was encouraging runners (well, walkers and climbers is more accurate), was encouraging me, and had even found and handed me a big stick for me to use to help keep moving. I have never in my life felt so drained of energy. So incapable of movement. I leaned heavily against the stick, leant against rocks. I disappeared deep inside of myself trying to find the will and ability to move my left left, even slightly. I was weighing up my options – walk down and get a lift back, or push on to the top and get a lift from aid 2? I didn’t feel as though doing another 7km or so was even possible. Every step, every painful, heavy and ridiculously tough step required me to dig deeper and deeper. Thoughts flashed into mu mind – my friend Scott’s favourite saying “relentless forward progress”, what I’d read by Dean Karnazes about how he enjoyed seeing how much pain he could take, and my car rego! With the encouragement of Ben, and all that deep digging, I got to the top. I didn’t enjoy the view as much as I should have, this wasn’t a case of “the view from the top” making it worthwhile; THIS was about grinding it out and pushing on to enjoy the finish. I hated most of the next couple of kms. My guts burned, my quads screamed and I was drained and shredded. I plodded on slowly, it seemed to take so long that I thought I must have missed aid station 2. Eventually i dragged myself to aid 2, there were 5kms left from here. “One parkrun” I told myself. The final km dragged on a bit, and it was with great relief that I finally saw the giant orange inflatable PTS start/finish archway. 5 hours 25 minutes. And I have never been happier to have a piece of recycled jarrah thrust in my hand. Brilliant event, a tough course (I still have no idea how anyone did 2 laps) and I have no end of gratitude for the organisers and volunteers and Ben Oxwell in particular. Will I do it again? You bet….